Mineral processing commissioning plant specialists at PPM Global are pleased to have a long-standing relationship with Tiger Resources and their Kipoi SEK Copper Project 75km northwest of Lubumbashi the capital of Katanga Province in the Democratic Republic of the Congo. PPM has been engaged on many occasions to assist with commissioning the SX/EW plant and its subsequent expansion and optimisation. 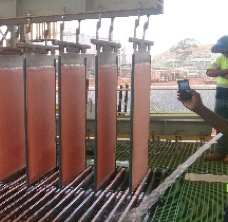 Late 2016 saw PPM re-engaged for commissioning and optimisation with a small slimes leaching – 50 tph feed rate – to further increase production of LME grade Copper at Tiger’s Kipoi site. PPM Global’s senior process specialist Daryl Platt has been working on the tailings and the trash screen. When complete, the design will have capacity of 50 tph in wet tons over the feeder belt. “The plant is currently producing 43 tph of copper which in turn is producing over 1,000 tonnes of copper per day, so we have come a long way,” Darryl said. PPM has also been assisting with a separate project scope for optimisation around their SX EW current efficiency program. PPM’s client realised the need to have personnel re-visit the copper SX/EW process that was commissioned in 2012 and review the current operating practises. PPM was asked to present a proposal that would allow the client to lift the knowledge and skills level by reinforcing best practice recommendations, so that Kipoi’s site team could move towards maximisation of operability throughout the copper production plant. This involved reviewing the current practices used by the operations teams and detailing missing equipment and tools to operate the copper SX/EW plant correctly. With site assistance, a speedy procurement process soon had all the required tools and equipment delivered to site for when PPM’s senior process specialist returned to initiate the improvements. PPM is pleased to have a long-standing relationship with Tiger Resources and their Kipoi SEK Project 75km northwest of Lubumbashi the capital of Katanga Province in the Democratic Republic of the Congo.